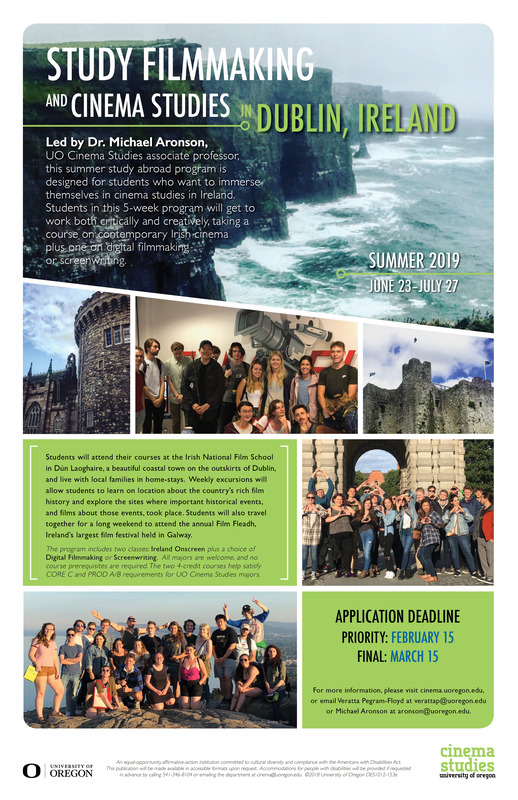 This summer study abroad program is designed for students who want to immerse themselves in cinema studies in Ireland. Students in this 5-week program will get to work both critically and creatively, taking a course on contemporary Irish cinema plus one on digital filmmaking or screenwriting. More than $10,000 in scholarship funds are available for students accepted to this program. If interested, please refer to the Dublin Scholarship Essay in the program application or contact your study abroad advisor. Students will attend their courses at the Irish National Film School in Dún Laoghaire, a beautiful coastal town on the outskirts of Dublin, and live with local families in home-stays. Weekly excursions will allow students to learn on location about the country’s rich film history and explore the sites where important historical events, and films about those events, took place. Students will also travel together for a long weekend to attend the annual Film Fleadh, Ireland’s largest Film Festival held in Galway. Ireland Onscreen: Study filmmaking in Irish history, Irish filmmakers, and the cinematic reflections of the key elements of Ireland's cultural history. Digital Dublin: An intensive hands-on digital filmmaking course held in and around Dún Laoghaire. Ireland Screenwriting: Students will work with a professional Irish screenwriter to adapt an Irish short story into a short film screenplay. The program includes two classes: Ireland Onscreen plus a choice of Digital Filmmaking or Screenwriting. All majors are welcome, and no course prerequisites are required. The two, 4-credit courses help satisfy Core C and Production A/B Requirements for UO Cinema Studies majors. For more information about Cinema Studies in Dublin, Ireland, please contact Veratta Pegram-Floyd at verattap@uoregon.edu or Michael Aronson at aronson@uoregon.edu. Additional information is also available at UO Global Education Office website and the GEO Cinema Studies in Dublin website.